Meet a medley of mountain-loving outdoor-adventure people at the Keswick Mountain Festival. The BMC is back and we’ll be running skills workshops, films, talks, music and quizzes until the stars come out. What’s more, there’s free beer for BMC members. The mountaineer Sir Hugh Munro died in 1919, entirely unaware of quite what a mountain of obsession he had started with his ‘Munros Tables’: a list of Scottish mountains over 3000ft that he had published in 1891. 100 years on, Munro-bagging is a popular hobby and ticking all 282 remains a considerable achievement. To get you started or to bump up your ticklist, here are seven of the easiest Munros on the list. A couple of weeks ago, Margo Hayes redpointed her third 9a+, Papichulo at Oliana in Spain; this time belayed by her boyfriend Alex Megos. Back in 2017, a lot of talented and hardworking women were gunning to be the first to climb 9a+. Margo Hayes was not on anyone’s shortlist when she ticked La Rambla in Siurana, Spain that February. By September that same year she had climbed another 9a+, Biographie at Ceuse. Now she’s ticked her third. How does she do it? Tom Ballard, a prolific and talented British climber, died on Nanga Parbat with his Italian climbing partner Daniele Nardi. We pay tribute to Tom, the son of another very talented climber who also died in the mountains: Alison Hargreaves. Weekend forecasts show snow is set to return in the mountains, with freezing levels dropping to as low as 800m in the Scottish Highlands and 600m in the Lake District over the weekend, according to the Met Office. Andy Nisbet and Steve Perry, two highly experienced climbers, have died in a fall on Ben Hope. A selection of pics from Alex Messenger, the editor of Summit magazine. 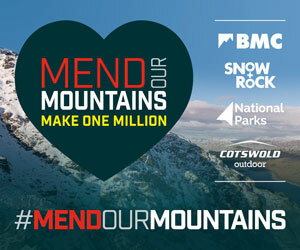 bit of an unfortunate juxtaposition there, putting the 'mend our moutains' links at the end of this list makes it look like that campaign is an April Fool too! What format digital images do you take? How do I get my photos in Summit? How do I write for Summit? How often is Summit printed?